Getting ready to celebrate a birthday soon? Maybe you’re planning a special milestone like a Quinceañera, Bar Mitzvah/Bat Mitzvah or B’nai Mitzvah/B’not Mitzvah or even a 60th birthday. Or maybe it’s not even a birthday, but a celebration that deserves a unique look. No matter what the celebration may be, Be In Love Designs can create custom invitations that will set your event apart from the rest. Since we are graphic designers, it easy for us to create a birthday invitation that will match the mood and theme of your event. 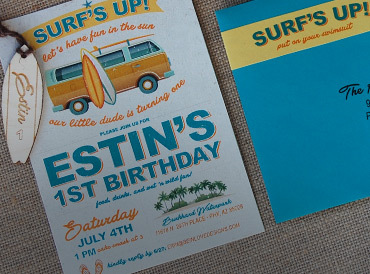 Keeping you budget in mind, we can explore different printing, paper and layering techniques that will elevate your invitation. Book an appointment today to get started on your party invitations.